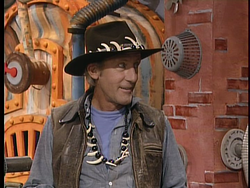 Alligator Dundee is a human of Australian origin and a character from The Super Mario Bros. Super Show! In The Super Mario Bros. Super Show! episode of the same name, Alligator Dundee finds himself in Mario Brothers Plumbing after chasing what he perceives to be a horrific monster through the New York sewer system. Meeting Mario and Luigi in their apartment, Alligator Dundee, after telling the two about the creature he is chasing, enlists their aid in helping him capture it. As Luigi searches for the monster through a periscope, Alligator Dundee and Mario prepare a net. Having finished preparations, he tells the Mario Bros. the plan to capture the monster, which involves luring it out of the sewers, then Mario throwing his net over it and Luigi tying it up with a rope. After being called crazy by Luigi for having created such a dangerous plan, Alligator Dundee is asked what the creature they're hunting for looks like; taking out a picture of the monster, Alligator Dundee shows the Mario Bros. a picture of their friend the Ratigator. After showing Mario and Luigi this picture, Alligator Dundee, having not been told by Mario and Luigi that the Ratigator is harmless, begins to enact his plan to capture the creature after sharpening a large knife he plans to use against the creature if it attacks him, Mario, or Luigi. Alligator Dundee, then climbs into the Ratigator's sewer home and tries to lure it out into the open with a tuna sandwich, as Mario and Luigi wait nearby, having surmised that he is the being that has frightened the creature earlier. Alligator Dundee soon finds the Ratigator and, after fighting with it, yells to Mario and Luigi to prepare to capture it. However, instead of the Ratigator, Mario and Luigi capture Alligator Dundee in their net as he flees from the sewers. They only realize that they have captured him after he has already been knocked to the ground. As Alligator Dundee struggles in the net, Mario and Luigi tell him that the Ratigator is their pet and that he shouldn't have been trying to harm it. Hearing this, he apologizes to the Mario Bros. for trying to capture the Ratigator and explains that if Mario and Luigi had only told him the Ratigator was their pet, he wouldn't have continued his hunt for it. After being freed from the net, Alligator Dundee begins to bemoan his fate, saying that he has moved all the way to America from Australia to capture a creature like the Ratigator, become famous, and marry a "beautiful American woman". Hearing Alligator Dundee's story, Mario and Luigi say that it could make a great movie. After getting this praise, Alligator Dundee decides to create a movie from his story and also decides to change his name, to Ratigator Dundee after befriending the Ratigator. Alligator Dundee is a parody of Michael J. "Crocodile" Dundee, a character from the famous film Crocodile Dundee. This page was last edited on January 30, 2019, at 00:25.